(Phys.org)—A team of researchers with Monash University in Australia and the West Indies Marine Animal Research and Conservation Service has found that changes in temperature and rainfall in the West Indies is not a factor in the declining rate of survival of leatherback sea turtle hatchlings in the U.S. Virgin Islands. In their paper published in the journal Royal Society Open Science, the team details their study, noting that more research is required to find the true cause of the declining survival rate of the hatchlings. Leatherback sea turtles are truly unique. Not only are they the only species of turtle without a hard shell (they have thick leathery skin on their backs instead), but they are the largest species of turtle. Because they lay their eggs in the sand, prior research has shown that the hatchlings that emerge are likely to be particularly vulnerable to climate change. In this new effort, the researchers looked at 20 years of data for the turtles that hatch at the Sandy Point National Wildlife Refuge to gain some insight into the impact climate change might be having on the local population. The researchers report that hatchling survival rates over the years 1990 to 2010 dropped from 74 percent to 55 percent—an amount that is likely to have a serious impact on population growth over the next few decades—the turtles are long lived, though no one has been able to prove how long. Estimates range from 30 to 50 or even 100 years. Prior studies have also found that the survival rates for the hatchlings has declined, and the assumption is that changes to the environment are the cause. To find out if that was the case, the researchers compared hatchling survival rates for each year over the two-decade span with temperature and rainfall that occurred during nesting season in the area. They report that they were unable to find any correlating factors. They also report that there were occasional changes that caused problems for the hatchlings, but they are not trends. They further note that their findings are particularly confusing in light of the fact that turtle population counts in the park have been rising over the past several years. Unprecedented increases in air temperature and erratic precipitation patterns are predicted throughout the twenty-first century as a result of climate change. 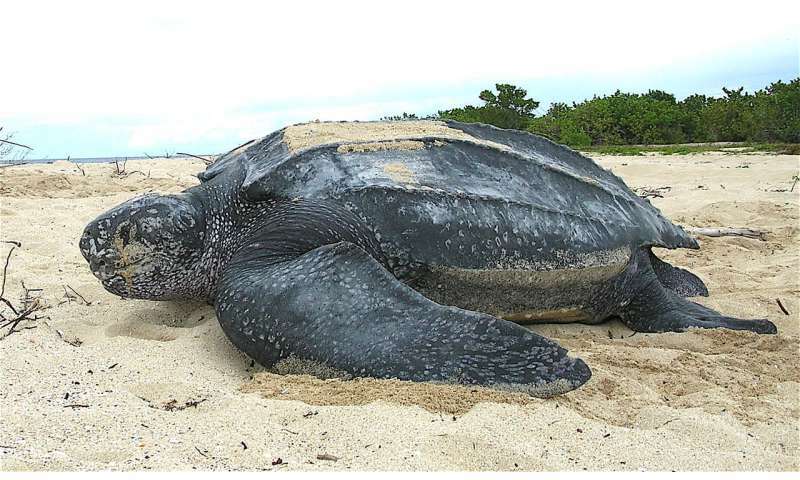 A recent global analysis of leatherback turtle hatchling output predicts that the nesting site at Sandy Point National Wildlife Refuge (SPNWR) will experience the most significant regional climate alterations. We aimed to identify how local air temperatures and precipitation patterns influenced within-nest mortality and overall hatchling output at this site between 1990 and 2010. We show that while the greatest mortality occurred during the latest stages of development (stage three), the rate of embryo mortality was highest during the initial stages (stage zero) of development (approx. 3.8 embryos per day per clutch). Increased mortality at stage three was associated with decreased precipitation and increased temperature during this developmental period, whereas precipitation prior to, and during stage zero had the greatest influence on early mortality. There was a significant decline in overall hatching success (falling from 74% to 55%) and emergence rate (calculated from the number of hatchlings that emerged from the nest as a percentage of hatched eggs) which fell from 96% to 91%. However, there was no trend observed in local temperature or precipitation during this timeframe, and neither variable was related to hatching success or emergence rate. In conclusion, our findings suggest that despite influencing within-nest mortality, climatic variability does not account for the overall decline in hatchling output at SPNWR from 1990 to 2010. Further research is therefore needed to elicit the reasons for this decline.